The Balalaika with origins in the XVI century (sometimes wrongly referred as "russian guitars") is one of the major Russian musical instruments, along with the Domra, the Accordion and the Guitar.The Balalaika most likely evolved from the Oriental Dombra, which is still played in present-day Kazakhstan. It is said that the Balalaika embodies the Russian people's character, with its ability to switch from happiness to sadness with ease. It was common for the peasant ballads, composed for the Balalaika, to irreverently poke fun at the authority of the times. For this reason there were times when the Balalaika was banned by both the Orthodox Church and the State. 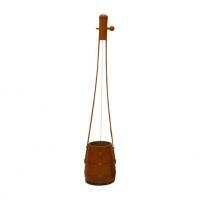 The instrument enjoyed its greatest folk popularity in the early 18th century. It was also carried by the common people when they fled Russia at times of war. This instrument is characterized by the triangular body (a trait that it acquired in the XIX century) and three strings (or six, in three double courses).The Balalaika is a member of the Lute family and is made in a number of sizes; Piccolo, Soprano, Prima, Secunda, Alto, Bass, Contra-Bass and Sub-Contrabass. The lower pitched the bigger the instrument is.All have three-sided triangular bodies, spruce or fir tops and backs made of from three to nine wooden sections, and usually have three strings. The prima balalaika is played with the fingers, the sekunda and alto either with the fingers or a plectrum depending on the music being played, and the bass and contrabass (equipped with extension legs which rest on the floor) are played with leather plectrums. It was in the XIX when it started to be featured in orchestras aside from the folk music. The Balalaika strings are tuned above middle C to: A, E, E (1st-3rd). The 1st string is the thinnest, and lays over more frets than the 2nd & 3rd strings. 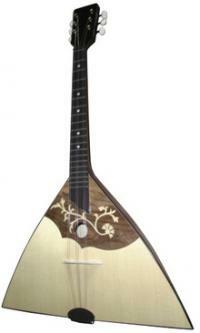 You can find some deluxe nice looking Balalaikas from Ethnic Musical Instruments store. If you're intending to buy a balalaika online we recommend you to read this review article "buying and selling balalaikas in ebay" with some tips and advice. Beware because some balalaikas offered for cheap price are more a souvenir than a professional instrument. 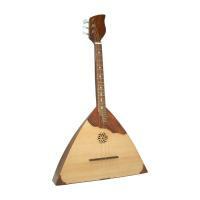 A professional balalaika can cost up to 1000 dollars, though you can find some decent working ones for around 300$. Anyway you can find balalaikas in ebay for reasonable price and quality out of different stores, some vintage and second hand but in good playing condition. If you're based in Europe you can purchase rather affordable Balalaikas from the german hyperstore Thomann like the following. Above: Balalaika listed in Thomann Music Store. 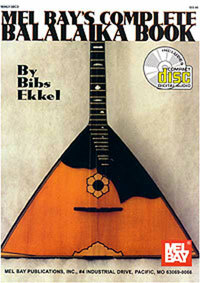 To teach yourself to play balalaika we´ll spotlight Mel Bay's Balalaika book by author Bibs Ekkel as instructional material. It has 160 pages and features a CD. 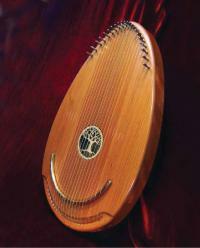 It features a nice section about the history of this traditional instrument. There are different variations in the construction. Pressing the two halves of the neck together pushes the peghead away from the body, thereby tightening the string and raising its pitch. The modulation of the tone with each slight flexing of the neck gives the Gopichand its distinctive sound. There are no markings or measurements to indicate what pressure will produce what note, so the pressure is adjusted by ear. This one stringed instrument provides a range of deep sounds, in one long slur. The length differes being 2-3 feet i the most common measure and consists of bamboo that is split through most of the length. 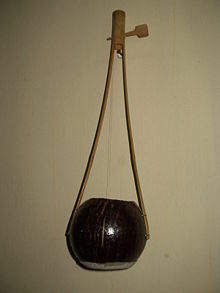 The two ends are pried apart and attached to a resonator made of coconut, gourd, a metal container or a hollowed out cylindrical section of wood. 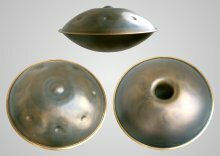 The open end of the resonator is covered with taught skin and a string penetrates the centre. This string is attached to a reinforced section in the centre. 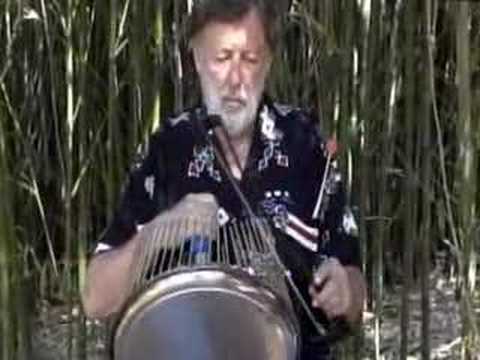 This string then passes through the hollow of the resonator and attaches to a tuning peg located in the bamboo. The sound of the gopichand is most distinctive. There is a peculiar bending of the pitch as the two legs of the bamboo are squeezed together by the left hand while the right hand plucks the string. Below you can see a video showing how it's played and its overall sound. In this store you can find soprano, tenor and Bass Gopichand. You can also buy there gopichand replacement strings. 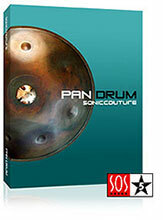 -Etnian.com is a store placed in Spain that specializes in world instruments and have gopichands in several sizes. Page can be also loaded in english and other languages. 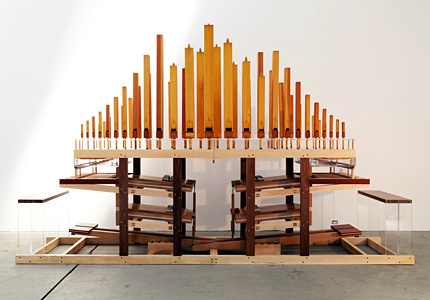 Being the creators best friends they conceived it as a "tandem" instrument so each of the two players has a keyboard with alternating notes of a four octave scale and must pump to supply the wind to the other player's notes. The way it is played renders a final melody that is never quite the same and thus it has a great component of improvisation in it yet not so, as they have scored special melodies to be played this way. It sounds very "vintage" and "dreamy"
Below you can see some videos of the AUERGLASS and these two talented ladies in action. Performance outfits created for Tauba Auerbach and Cameron Mesirow by Ida Falck Øien. I've always loved theremin... one of the first electronic instruments and with one of the most eerie sounds so close to the human voice and still so difficult to tune and play. One day for sure, it's in "I must have" list.I've felt tempted to buy a theremin several times, though price for a decent one rounds 450 dollars and up.Thus I ended up surfing the net looking for several home-made theremin like gadgets just investigating and I ended up finding the blog of this talented man Ken Moore http://www.kenmooredesign.com, that has managed not only to make affordable home-made thermins but also add a very cool and visual aspect to the playing. 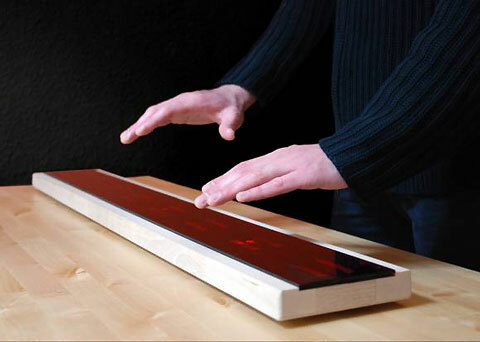 Above: Homemade Wiimote-powered Theremin made by Ken Moore. 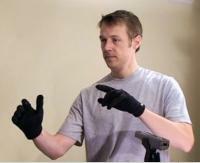 The technology links a Wiimote controller, infrared LED gloves and a Roland JV-1080 synthesizer to create Theremin-like sounds (sine wave) or a nearly endless world of bizarre sounds. 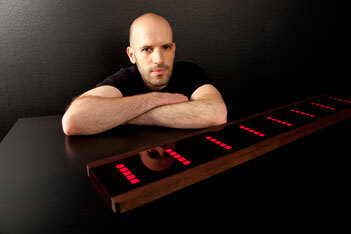 And the overall cost was 35$ to have your own MIDI theremin. I may say I already collected the materials... so feeling tempted to try this one soon and adapt it to my show. :) There are specific guidelines and instructions at his site. Recently Ken surpised us with a new idea... his kinect theremin with a visual representation of the intensity and pitch by brightness and different hues for the notes. Well see yourself... and everything explained as the other example in his blog. The Reverie Harp is not an Harp itself, it's a kantele or gusli like instrument (more than an harp should be related to zithers or psaltery) but it is itself a groundbreaking new instrument invented and designed by Music Makers in Minessota (USA) along with australian music thanatologist Peter Roberts. An instrument that's opening doors to musicians and non-musicians alike, providing soothing music therapy with little or no practice or training because of being tuned to pentatonic (five-tone) scale all notes are in harmony to create pleasant melodies when strumming its . With no wrong notes it i's very simple to play it and render a heavenly enchanting penetrating and in words of many healing sound wether plucking individual or multiple strings, strumming or even hammering with dulcimer hammers and other tools. Thus the Reverie Harp® is quickly being embraced in children's hospitals, chemotherapy units, maternity wards, surgery recovery, hospice centers and by music therapists as a music therapy tool to calm and comfort patients to soothe stress becoming a must-have a must-have tool for music therapists, visitation ministers/chaplains, activity directors, and nursing homes care-givers. If you're lucky you can find it often reverie harps in ebay too, sometimes with slightly cheaper auctions or second hand. The instrument has a solid cherry timber frame and solid red wood mahogany soundboard providing a great quality to the sound but is small (50x32cm)l, lightweight (4 lbs/ 1.80 Kg) and easy to hold with no sharp edges and it features a lovely carved tree rosette making it also pretty to look at. It's smooth, egg-like shape is inviting and designed to be held on a lap or shared between two players, such as a music therapist and patient. With 22 wire strings its unique design requires no skill to play, yet produces beautiful, soothing harmonies with the stroke of a finger. Easy to hold, easy to play. 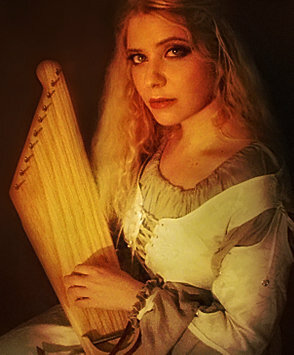 Small stringed instruments like the kantele, the lap harps (both of which we previously covered here in our Cool Music instrument blog), or the reverie harp are known worldwide because of its ability to calm and relax both the player and listener and convey really deep emotion in a very easy way. 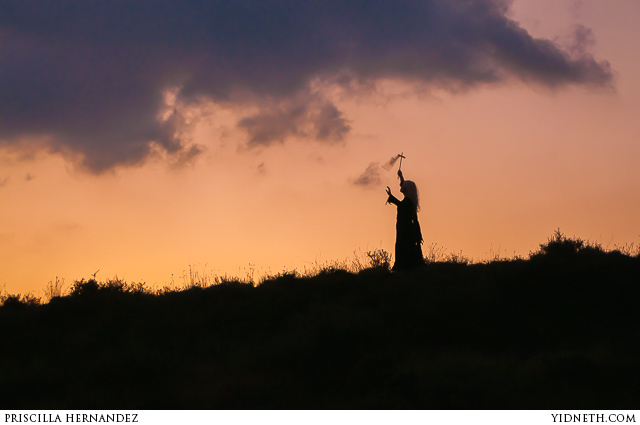 The Reverie Harp® (reverie means a state of daydream or meditation) is a universal instrument that requires no practice or musical training because it is tuned to a pentatonic (five-tone) scale in which all notes harmonize to create pleasing melodies. 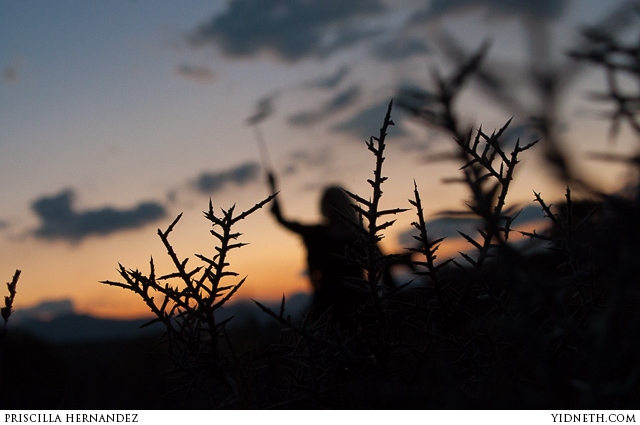 As a result, there are no wrong notes to play and people are captivated by this simple instrument. Care-givers from around the world are sharing stories of how this new instrument is helping people relax, restore, and relate.